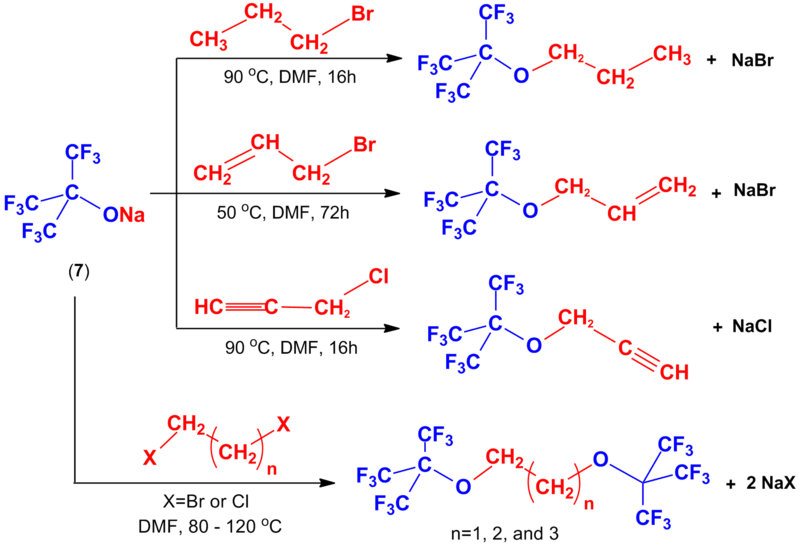 The fluorous biphasic concept was based on the temperature regulated separation of saturated perfluorocarbons and organic solvents and the attachment of fluorous ponytails to reagents and catalysts in appropriate size and numbers (Science, 1994, and Acc. Chem. Res. 1998). The term “fluorous” was coined by the analogy to aqueous. The preferred size was in the range of C6-C12 perfluoroalkyl-chains to achieve high fluorous solubility and partition in two phase systems. 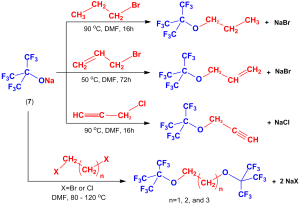 Compounds with C6-C12 fluorous ponytails could form C6-C12 perfluoroalkyl acids in the environment, some of which are persistent, toxic, and have long half-lives in humans. The replacement of longer perfluoroalkyl-chains with shorter C1-4-perfluoroalkyl-groups was proposed to limit accumulation and ensure high fluorous solubility in 2005. For example, we have been using perfluoro-tert-butyl, perfluoro-n-butyl, and perfluoro-n-propyl groups to synthesize novel fluorous aromatics, heterocycles, ethers, diethers, and functionalized ethers (Phys. Chem. Chem. Phys., 2012 and Org. Chem. Frontiers, 2014).